Professional, Young, experienced and friendly. Shah has successfully placed many Students into Grammar Schools by coaching students to pass the common entrance exams such as the Consortium of Selective Schools in Essex (CSSE) and Redbridge CEM exam that includes Ilford and Woodford County. Furthermore, Shah has prepared students to take entrance exams for schools such as Bancroft and others. Inaddition, Shah has proven track record of improving students KS3 and GCSE results by two or more grades with students achieving better than expected results in maths, chemistry, biology, physics and English as demonstrated from parental and student feedback below. In 2018 most of his students attained level 9 and 8 for GCSE Maths and English. 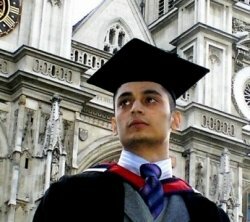 Shah is a knowledgeable graduate from London who studied a BA in Business Management and Accounting & Finance. Having studied 4 A levels including Mathematics and Chemistry, Shah is able to offer tuition in a range of subject within the curriculum including Mathematic, English, Science, 11+, 13+, entrance exams, economics and accounting. He is a patient and supportive tutor with several years experience teaching pupils. He is familiar with the GCSE and A level structure and is confident in preparing pupils for GCSE's, eleven plus entrance exams and A-levels. Many of his pupils have been successful, exceeding above their predicted grades. Shah has worked with local schools around London. He is an inspiring and enthusiastic tutor who will cater for your child's needs through a child-centred approach. Shah has previously worked in a tuition centre and than later set up a tuition centre with classes in groups of ten based in Islington. These classes taught 11 plus lessons; including Maths, English, Verbal Reasoning and Non-Verbal Reasoning. Furthermore, two GCSE classes were set up for English and Maths. These classes are very successful with outstanding results. "Thanks Shah, Beth got A*s for double science and maths, we are very pleased"
"Very happy, he got A* in maths, A in biology, A in chemistry and B in physics. Thank you so much for your help. We will be in touch soon for the girls if thats ok."
"Hi Shah, trust you and your family are well. We have recieved good news (unconditional offers) from two out of the four schools Subomi sat exams for. She wants me to say a big thank you to you, am indeed thankful too!" "I just wanted to say thank you for all the help and support that you have provided for my son. He has got an A in maths"
"Chiara has got offers from Channing, Francis Holland and Queens so she did very well. My friend has asked for your details, is it ok if she gets in touch. All the best and thank you again." "Hi Shah, got an A* in Chemistry, A in Physics and B in Biology. Thanks for helping me." "I just thought you should know that Pearl has been offered places in Latymer Upper school, Queens gate 100% paid place. South Hampstead 50% and Channing at full fee paying. We have chosen Latymer upper school for Pearl - all paid for seven years!! Thanks for the help you gave Pearl." "I got an 8 for maths. Thank you"
He engages the student using innovative teaching methods to build their confidence, help with homework, to sustain and retain their learning to exceed above those target grades. Shah strongly believes that he can develop a student’s current knowledge by personalising their learning and addressing difficult areas of the curriculum by making links to real life contexts and personal interests. This has been proven to be an effective method within classrooms in outstanding schools and is therefore replicated within a one-to-one scenario. How long have you been a tutor? I have been tutoring since 2006 and on this portal since 2012. Do you have a CRB/DBS (Criminal record check) that you can send? I have provided a copy to this site however I can not send you directly due to website policy. Heres my number 079... Can you call me? This portal will hide your number when the message is sent. So I can not call you until you have agreed to start lessons. Do you travel to our home? Yes, I drive to you. I will check your location to consider travel time before offering time slots. I have limited slots however feel free to contact me via the website to see if I have a slot that can work. Once we agree and you purchase my details from site I will pencil you into my diary for an agreed date. How do I get your contact details? You have to purchase it through this portal. How much does it cost to get your details? Honestly, I am not sure how the portal pricing structure works however I do offer 50% (£15) discount on first lesson to compensate you. Yes, I have many; however I can not send to you until after you obtain my contact details. Furthermore, below are comments and ratings from real parents that have purchased my details. I can create material depending on child and objective. I will also recommend relavant books. I have used online material including GCSE past papers however it will most likely to be a combination of all of the above. Do you give feed back? I always give feed back verbally at the end of a lesson unless parent is not present. I do not give emails of lesson report as I would have to write this report during the lesson. I would rather give my full attention to the lesson. Cash at the end of the lesson or by bank transfer. Are you a good tutor? Good tutors are hard to find and are usually are in high demand. I am very busy and parents often refer me to others. Therefore I like to think I am a good tutor. Can you work with my child? Honestly, its best just to try one lesson and see. The relationship between tutor and tutee needs to be just right to get best results. Can you reduce your fee? I am not willing to reduce my fees as all my students are paying the same rate. I am also very high in demand from referrals, existing students wanting additional lesson & new tutees who are all happy with my fees; therefore I can not Justify taking someone on for a reduced amount. Some are even offering me alittle more than my fee to secure a slot as I have limited time slots. Do you have time slots? My diary can change rapidly due to the nature of tutoring. Simply send me a message and I will check my diary, consider travel time and than offer you some time slots. Saturday 10am-12pm 11 plus and common entrance exams. Wednesday at 6-8pm GCSE Maths lessons. Friday 5.30-7.30pm 11 plus and common entrance exams. The class size is limited to maximum of ten students in order to maintain high quality teaching ratio. Please contact me if you would like more information. Please Note: £15ph rate is for group lessons and £40 for one to one. Please log in to download free tutor resources. good focused classes. I can see the progress being made. Thank you Shivani, Ganika seems to really enjoy the fun lessons that I have constructed in our classroom. Furthermore; she has gained in confidence and thus engages in group activities. Thank you for your feed back. I am really enjoying teaching your twin daughters and preparing them for thier GCSE examinations. They have already improved by two grades in the last month and I am very confident we will get good results. Shah has been working with my daughter for about a month so far. He is a good tutor who explain concepts in detail. Her maths understanding has improved so much under his care. He is very attentive and helpful. Shahadat has recently started tutoring my son for the 11+ Exams. He is punctual, presents as a thoughtful, respectful and talented tutor. He explains lessons in simple terms which helps my son to understand. Thank you for referring me to your neighbours. Its great to see Kevin score has increased from 25% to 90% in a few lessons. He has made awesome progress. Excellent tutor! He tutors my 15 year old daughter who has aspergers and dyslexia and is currently studying for the higher paper but had been falling behind. She describes her lessons with Shah as fun. I'm so pleased that she enjoys maths again because she was beginning to hate it. Thank you for your feedback. Its great to see Angel enjoying her maths lesson. 50% discount on your first lesson!